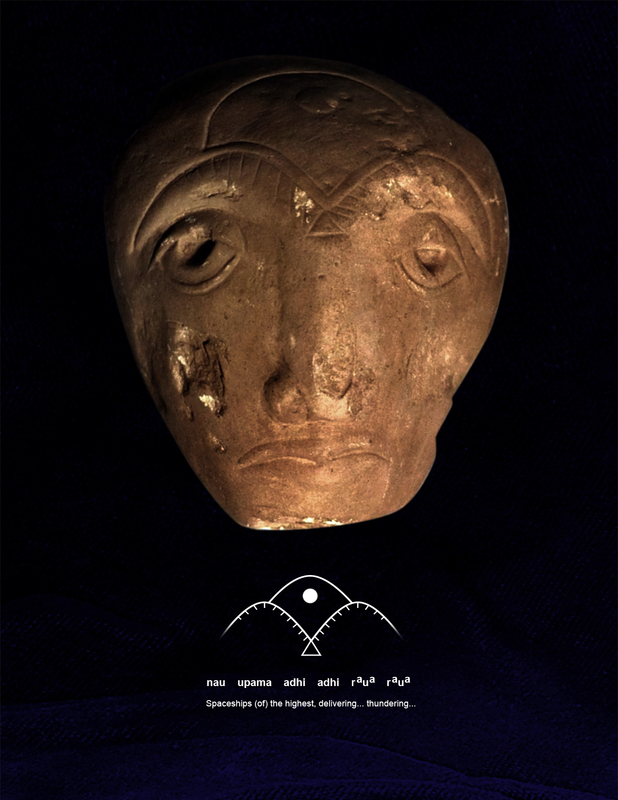 The collection of hundreds of stone and ceramic artifacts from Caria, Italy include several specialized objects that reflect quite complex aspects of Atlantean life. The Vedic physics principles of tri-frequency resonance, as applied in the collective design function of the three pyramids of the Giza complex, were signified as the 'triple works of the highest' that vitalize all life. Most controversial are the many Paleo-Sanskrit texts that reference the pervasive presence of spacecraft in the skies at that time. Atlantean texts describe the motive action of the pyramids' triple works using the 'adhi' glyph meaning 'delivering', which itself is a pictogram of a standing wave. This acoustic interpretation is upheld by their highly specific usage of the glyph, which was exclusively employed to describe those types of delivering achieved by standing waves, such as delivering various human races from subterran cities or delivering Jupiter's beneficial frequencies of life force in the range of the human heartbeat. The largest ceramic artifact from the Azzariti collection is a hollow, domed object with thick walls and three large openings that resembles a mushroom top. The form of the whole piece reflects the 3D structure of a standing wave, and each of the cutout openings forms a 2D standing wave pictogram. The visible exterior surfaces of the symmetrical object are also covered in many rows of repeating glyphs that reinforce the acoustic interpretation of the form and function of the object. Negative spaces formed by three large cutout holes form the 'adhi-as' ligature, meaning 'for delivering', while many alignments of repeating circular 'nau' glyphs run around the item's circumference providing the subject of the sentence: 'spaceships'. The object of the phrase is rendered as repeating 'as-vin' glyphs, meaning 'Dioskouroi'. 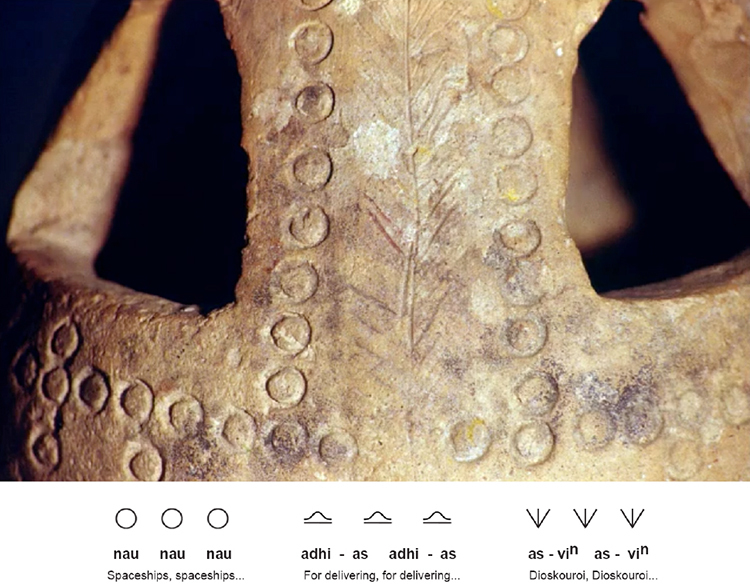 Thus, according to the Schildmann Paleo-Sanskrit decipherment, the inscriptions read coherently as: nau nau nau adhi-as adhi-as adhi-as as-vin as-vin as-vin --" Spaceships, spaceships... for delivering, for delivering... Dioskouroi, Dioskouroi..." (above). Dioskouroi is the ancient Greek name meaning 'sons of Zeus' for the twin demi-gods associated with the story of Castor and Pollux. Also referred to as the Hero Twins, they were regarded as the patrons of sailors, to whom they appeared as St. Elmo's fire (glowing plasma discharges). As well, the repeating 'as-vin' glyphs mimic the tree-like plasma formations of red sprites that were depicted with the Great Pyramid and circular spaceships, both of which are deeply embedded in the Paleo-Sanskrit writing system as basic geometric glyphs: the circle and the triangle. The subject of spaceships is referenced throughout the Paleo-Sanskrit texts from the Illinois cave archive and various other collections from the same time period that have yet to be recognized for their great importance. Present advances in the epigraphic interpretation of these texts allows unprecedented insight into the advanced use of piezoelectric materials at these sites for the previously unidentified purpose of therapeutic wireless implements that operate as transducers of infrasound resonance. Exclusive use of piezoelectric materials such as clay and calcite- or quartz-rich stones for the advanced construction of megalithic temples fulfilled a required crystalline property of acousto-electric transduction. These resonant materials enable levitation by acoustic means employing ultra-low frequencies, and were the only materials utilized for psychoacoustic monumental constructions. Sacred healing implements, psychoacoustic helmets, mathematical mandala representations and tablets inscribed with votive passages were also always fabricated from resonant piezoelectric materials. Every expression of their written language clearly reflects a comprehensive awareness of the infrasonic forces. Pictographic representations embedded in an incised circular sandstone piece combine three glyphs into a sentence: nau Indu las --"Spaceships of the Moon, shining" (above). Two lines of glyphs are also inset within an inscribed rectangle, reading: kara mu kar kar-as --"Maker stopping the works from functioning." Taken within the proper temporal context of a dark era following the catastrophic collapse of the Atlantean high civilization, this statement refers to the dysfunctional status of the global pyramid network. The Deluge had submerged the pyramids, causing the magnetic polar offset and diminished condition of planetary resonance after multiple impacts from cometary fragments. 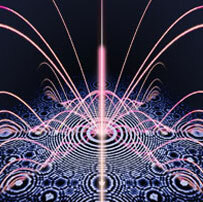 Sophisticated Atlantean metallurgical processes involved in the production of resonant metal alloys required for spaceflight applications have been identified in the work of renowned psychic channel Edgar Cayce, whose past life readings for Nikola Tesla and his associates revealed basic low energy electro-transmutation techniques. Similar phonon frequency resonance transmutation processes were shared in dialog with extraterrestrial contactee 'Billy' Eduard Meier, whose published contact conversations are supported by hundreds of famous photographs and audio-video recordings (see Appendix I). Atlantean transmutation processing of superhard, supermagnetic alloys comprised of every element on the periodic table incorporated the full breadth of atomic frequencies for replication of the full harmonic structure of gravity fields emanated by all planetary bodies. The Paleo-Sanskrit hieroglyphic language directly identified the 33 distinct infrasound resonances emitted by all solar and planetary bodies using the 'tridása' glyph for the number 30, and in every part of the world lamented the diminishing state of these invisible forces and the detriment to all life. While terrestrial humanity lost this advanced metallurgical knowledge along with the atomic physics principles of phonon resonance during catastrophic events over 12,000 years ago, metal debris from the famous 1947 UFO crash in Roswell, New Mexico displayed Paleo-Sanskrit texts that directly link the multitudes of spacecraft transiting our skies today with subterran Atlantean populations that have maintained their advanced technological means to this day. 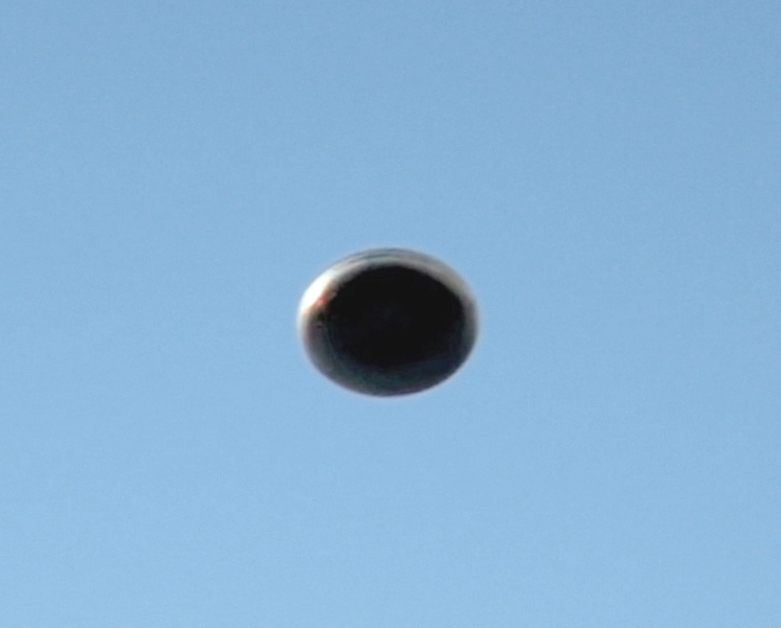 The perfect discoidal geometry of these spacecraft was captured in video taken in Milan, Italy by Antonio Urzi in 2012 (above). One of the most geometrically precise stoneworks among the hundreds of items recovered from the Caria excavations displays exactly the same form. Cracks and scratches on the stone suggest recent and ancient damage that accumulated over the thousands of years since its making. Dirt that has not been fully cleaned from the many incised markings preserves quartz crystals in tiny sand grains that can provide a timeframe for the internment of the object in situ, using thermoluminescence dating methods. One side of the discoidal stone presents a finely engraved series of lines that present the portrait head of a female figure seen in profile, partially encircled by seven glyphs of Paleo-Sanksrit text. The subject of the portrait is rendered very minimally, yet the Paleolithic artist's skillfully incised strokes capture the distinctly African facial features of a woman, with a gracile neck and sweeping hair. The surmounting line of text provides both the occupation of the woman and the significance of the stone object itself. 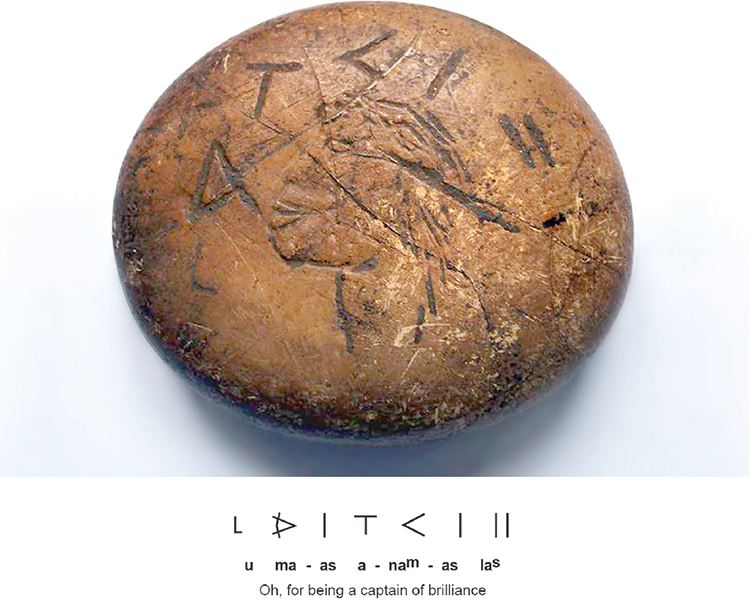 Apparently created as a commemorative award honoring the excellence of a ship's captain, the circular stone's 7-glyph headline reads: u ma-as anam-as las --"Oh, for being a captain of brilliance" (above). The word 'las' signifies 'shining, brilliant', relating a double-meaning implied by the object's shape. 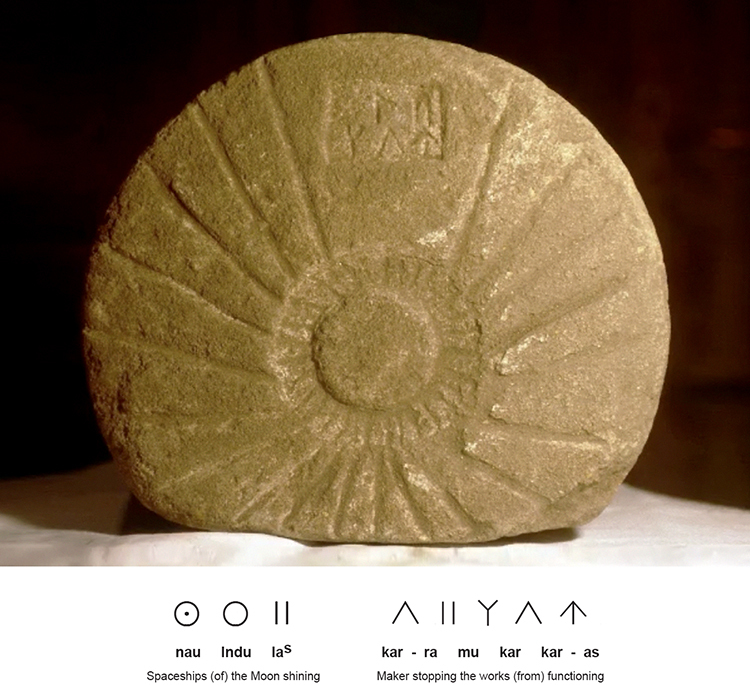 The form of the stone specifically represents the brilliantly shining, circular hulls of antigravitic spacecraft, as depicted by the circular 'nau' glyph, repeatedly praised in Paleo-Sanskrit votive writings from various continents, identified in the Illinois cave archive texts as 'high-built' spaceships 'delivering from below'. The reverse side of the commemorative portrait stone displays four bold glyphs that can be clearly read in boustrophedon format, confirming the discoidal stone was produced as a commemorative offering designed to confer the highest honors to an outstanding captain of shining, discoidal spacecraft. 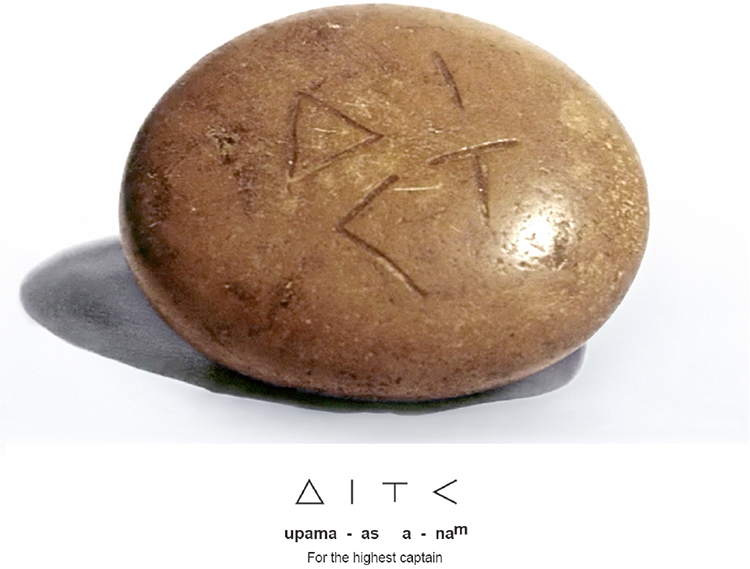 In contrast to those on the front face of the stone, the phonetic glyph pair 'a-nam' for 'ship's captain' is given from right to left in this text, as a brief statement of dedication that reads: upama-as anam --"For the highest captain" (above). Once again, the artifact's simplicity belies its great technological implications. Heroic actions of the captains and pilots of aerial and space vehicles are also related in ancient Vedic texts from present-day India. Called 'nau-vimana', many highly advanced capabilities ascribed to these remarkable ships are given in vivid accounts as hovering silently, disappearing instantaneously or emitting plasma beams and infrasonic pulses described as lightening bolts and thunderclaps. References to spaceships and their replication of thunderous planetary resonances are also inscribed into the surfaces of stone artifacts praising maternity. 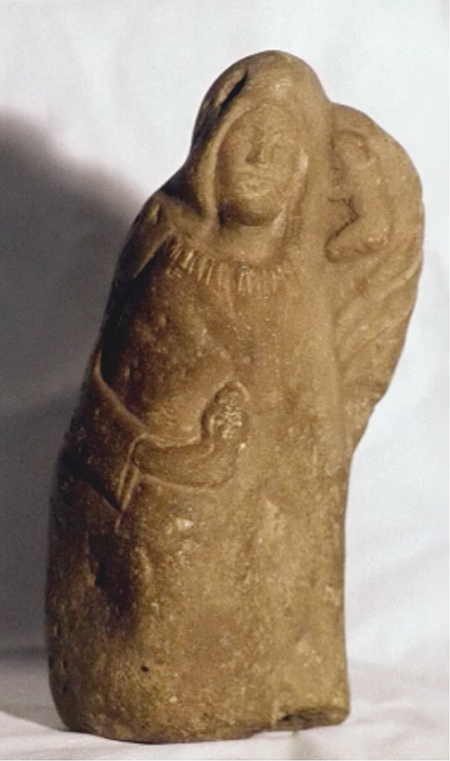 One small limestone figurine renders the form of a mother wearing a long dress with her newborn infant at her left side, while holding a small figurine in her right hand (opposite). 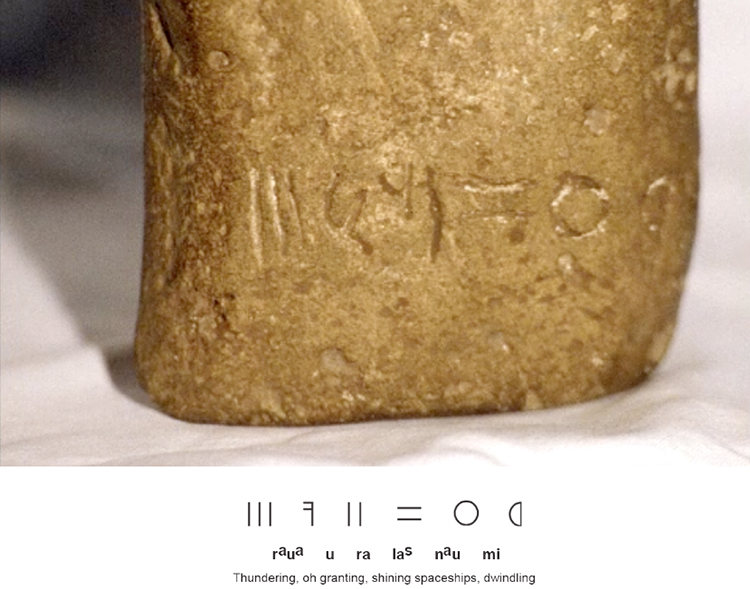 Lost benefits are lamented in a text on the artifact's backside, which clearly reads: raua u ra las nau mi --"Thundering, oh granting, shining spaceships, dwindling" (above). 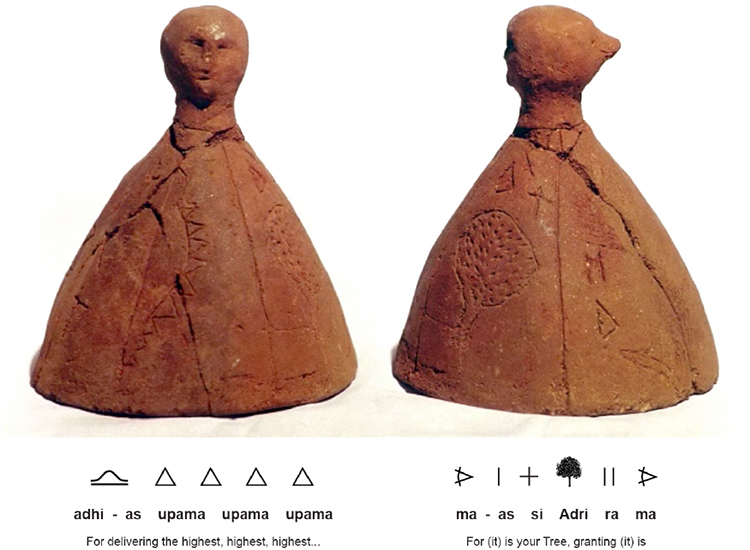 Sculptural references to spaceships and kundalini practices are also expressed in texts inscribed into a pair of slightly smaller than life-size stone heads from Caria. The bulbous head of a male figure with very wide set eyes, his eyelids slightly closed in the expression of meditation, displays a complex pictogram on the forehead. Showing the 'spaceship' glyph, three standing wave 'delivering' glyphs with their many accompanying 'thundering' glyphs, the complete phrase reads: nau upama adhi adhi... raua raua... --"Spaceship of the highest, delivering, delivering..., thundering, thundering..." (above, left). A second limestone sculpture of a figure's head has also been inscribed with glyph texts on its forehead. The highly unusual features of a bearded male figure --without a mustache-- include large eyes with wild waving eyebrows that mirror the 'delivering' glyph. Visually taking the form of a helmet, text on the forehead reads: nau adhi-as --"Spaceships for delivering" (above, right). This brief statement echoes a quite similar artifact from the Illinois cave archive and repeats the same set of unusual facial features that can only be recognized as the giant human hybrid Sasquatch that live in subterran cave systems. 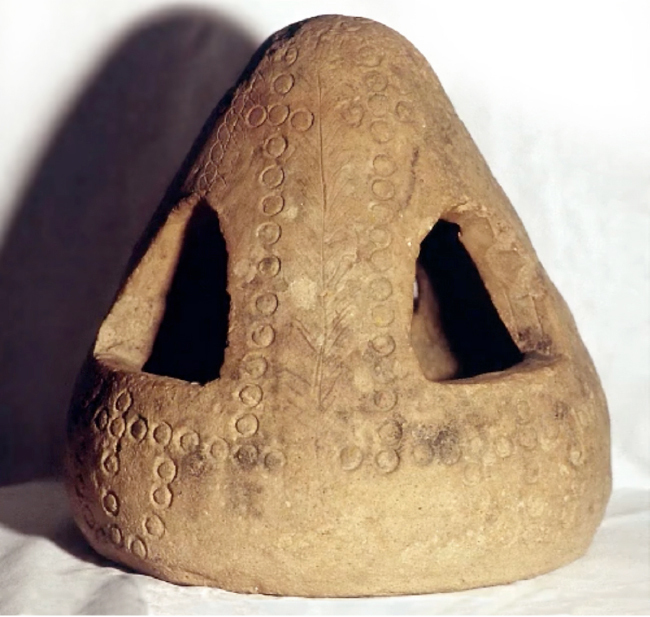 Also among the most contentious artifacts from Calabria, Italy are ancient Atlantean representations of an iconic dinosaur that is well known today from fossil remains from the Late Jurassic period, some 155-150 million years ago. 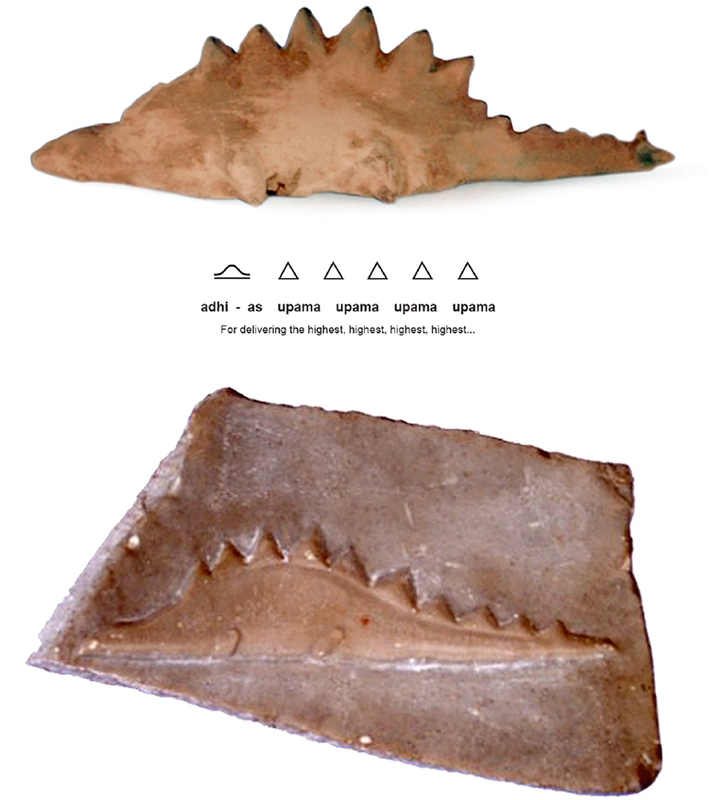 Multiple stone and ceramic sculptures from the Caria Valley include depictions of the heavily-armored Stegosaurus, an approximately 30-foot-long (9m) herbivore that protected itself with a long row of triangular shaped plates running along the spinal ridge from the neck to the spiked tail. Paleontological knowledge possessed by Atlantean scientists was taught to children during that far removed era in the same way it is today. Figurines are used to describe the anatomy of long-extinct dinosaur species, and the same clear purpose can be ascribed to those unusual figurines discovered by Mario Tolone Azzariti. 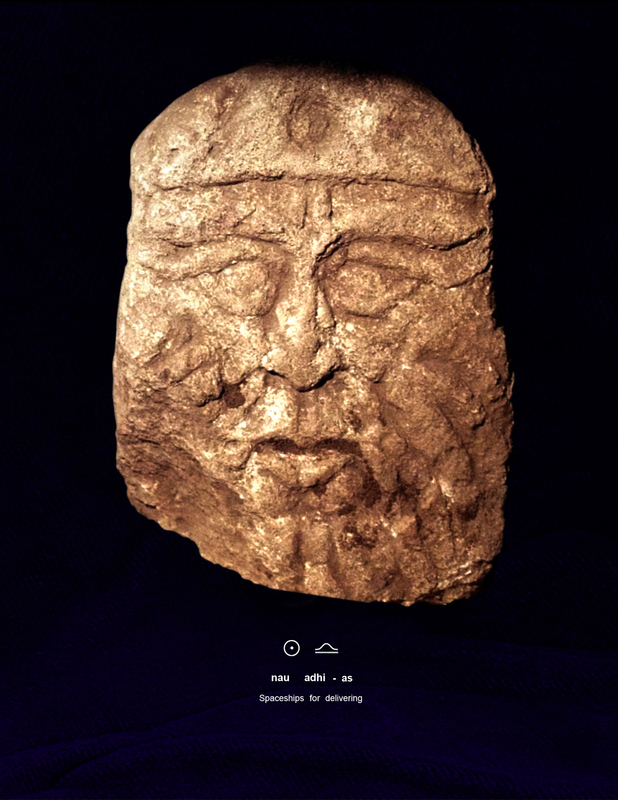 This purpose also informs the origin of ancient terracotta figurines from Acámbaro, Mexico discovered in 1944 by W. Julsrud and presently exhibited in a local museum baring his name. Relief sculptures adorning the Khmer temple of Ta Prohm also depict a Stegosaur, in Cambodia. At Caria, a ceramic figurine and a granite relief sculpture combine the forms of several glyphs into pictographic ligatures, expressing an entire phrase in a single image (above). The Stegosaur's body presents the form of the standing wave 'delivering' glyph, surmounted by a line of repeating triangular glyphs for 'the highest', reading: adhi-as upama upama upama upama --"For delivering the highest, highest, highest..." This pictogram is also rendered on a bell-like ceramic artifact from the Azzariti collection, as inscriptions that read: adhi-as upama upama upama upama upama ma-as si Adri ra ma -- "For delivering the highest, highest, highest... For it is your Tree, granting it is" (above). A pair of small stone artifacts has also been carefully shaped and incised with clear vertical rows of Paleo-Sanskrit glyphs. A polished greenstone carving has been engraved with a complex composition of multiple ligatures that reads: vi ya ya ya kar * kar sam traya upama * --"Through commencing, commencing... work, singular work of the universal protector, the highest one" (above, left). This selection of ligatures can be read in any order without significantly altering the intended reference to the each individual's spiritual work to burn off the karma that is accumulated through incarnation cycles. 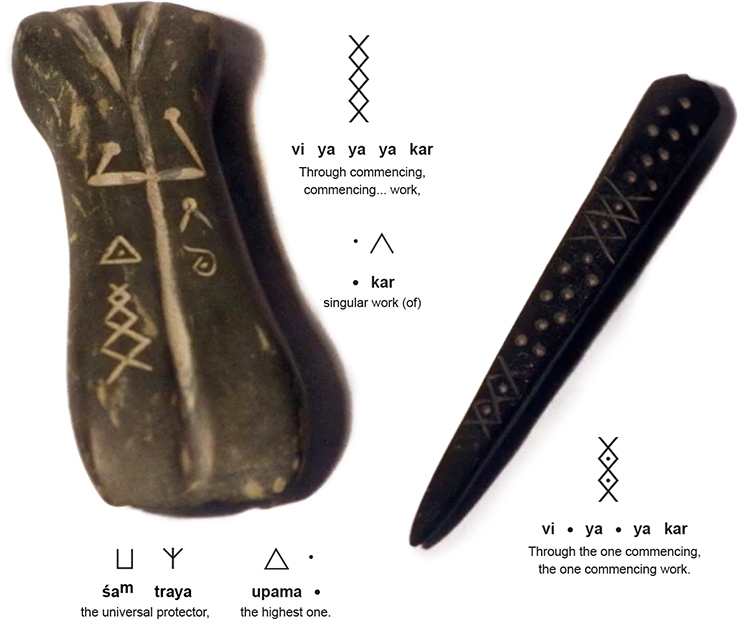 A delicately engraved black diorite awl displays a similar ligature that relates the simple votive passage: vi * ya * ya kar --"Through the one commencing, the one commmencing work" (above, right). The spiritual work being inspired in these devotional texts is directed inward, and is ultimately aimed at the liberation of past life memories stored within the subconscious mind of every individual. The consistent use of complex ligature groups by Paleolithic authors from disparate regions of the world facilitates their interpretation when applying the Schildmann cipher key, which offers a great breadth of phonetic references for completing accurate translations. Parallel passages and pictographic references shared by multiple groups of Atlantean relics reiterate the same profound messages lamenting the catastrophic diminution of planetary resonance and the thundering pyramids, as well as the dwindling numbers of spaceships delivering aid and transport to the many deep Atlantean subterran cities that survived the cometary impacts that terminated the Pleistocene era.